Born in Barcelona, ​​he studied music at the Municipal Music Conservatory in Barcelona with Joan Furio, where he earned a degree in Superior Professor of Guitar. 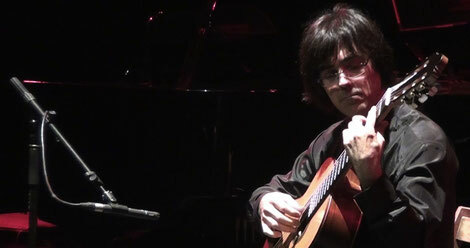 He completed his studies with teachers like David Russell, Manuel Barrueco, José Tomás, Stefano Grondona, Alex Garrobé and Manuel González, but specially with Mr.Alvaro Pierri at the Universität für Musik und Darstellende Kunst Wien, in Vienne where he obtained a Master Certifcate in Classical Guitar. He has performed as soloist, with orchestra and chamber groups in Spain, Europe and United States. In his career he has won several awards in national and international competitions and has made ​​recordings for radio and television. In 2003 he was selected to participate in the Youth Institute 2003 concerts, where he performed in several circuits of classical and contemporary music all over the country, emphasizing the concerts for the International Music Festival in Segovia and in the Theatre Conde Duque in Madrid. In 2003, he received a scholarship from the Society of Artists and Performers AIE to study at the prestigious Berklee College of Music in Boston (USA). Currently combines his concert activity with teaching; Roger Tapias teaches guitar at the Conservatory of Music Isaac Albéniz in Girona.